This is a remarkable backpack. I do not doubt its ability to last longer than I will. Style, durability, and break-in-pain just had a love-child. They named it the Thrux Pack. Tanden Launder, founder of Thrux Lawrence, has a particular personal style to him. It is very much what you would expect from a guy who makes an indestructible canvas and leather backpack. He wears a fine no-wash jean (also, he reviews denim here), leather boots, a simple cotton T, and rides a cafe racer. I have known him for a while since he is local to Coeur d’Alene and we have spent several cups of joe yammering on about quality and how things just are not what they used to be. Thrux Lawrence is his part of the fight against the onslaught of cheap goods. When Tanden tells you about his vision for American made products and quality construction you cannot help but be inspired. I was glad to get a call from him about his new creation. This has been in the works for a while and I have seen several prototypes (that I thought looked like finished products). Tanden was insistent that customers not see it until it was perfected to his satisfaction. You can purchase the Thrux Pack in “soot” and “brush”. One of the core principles of Thrux Lawrence is making their product in America. All the design, materials, and construction labor are American and will remain so till the end of Thrux Lawrence. I have nothing but admiration for this, considering the challenges manufacturing in America. We need more of this. Thrux Lawrence is limiting the number of Thrux Packs available to 44 and each will bear the number it was purchased in. Here is the #2 Thrux Pack. You should also notice the black and white photo from the 1950’s of working men. It’s not too terribly hard to figure out what the Thrux Lawrence target market is. It would not be fair to just give you a review of the backpack. For you to appreciate this pack for what it is you need to understand how it was sourced and made. The arduous lengths Tanden has gone to for finding the right materials are fascinating. The canvas is literally the heaviest canvas you can buy. There is nothing tougher than 24oz anti-mildew canvas. This is canvas that Filson is jealous of. For longevity it gets a ten out of ten. The leather is 9oz Horween. Only the most renowned leather tannery in existence. 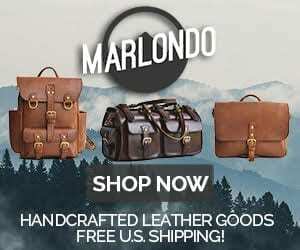 There are cheaper places to get good leather but none of their names are Horween and they certainly do not have a century long reputation of making great leather. The thread is bonded nylon 350 and 277 tex thread that was specially ordered for this backpack. This is heavy duty thread for leather and canvas applications. They had to restart the production to make it. Thrux Lawrence has enough heavy waxed cotton thread to make 1000 backpacks now. Nylon thread has excellent resistance to mildew, aging, and abrasion. But, it will deteriorate with prolonged exposure to sunlight (UV). The zipper is a huge #10 brass YKK zipper that should never have a problem. On both sides of the zipper are tabs to grab when you pull the zipper for fast zipper action. There are 28 #9 solid brass rivets. That is a ton of rivets. Have you ever tried to rip leather that is riveted together, much less with this many rivets? Good luck! The rivets are so tough they have broken several of Thrux Lawrence’s industrial compound nippers and no one can supply a nipper that can cut them. They had to custom make a pair that would do to job! Side note: You cannot buy steel rivets because they are difficult to make. Tanden was annoyed with this so he CNC’d his own steel rivets for the Bulwark Belt which Thrux Lawrence just released. That is dedication to aesthetic vision. If it do not last a lifetime for you, I will be surprised. Thrux Lawrence is obsessed with quality. I cannot find a single weakness. I am sure there is some point weaker than others but the prodigious use of double stitching, heavy nylon thread, 28(that is a lot!) #9 rivets, 9oz (the weight refers to the weight of a square foot of leather) Horween leather, and 24oz canvas (the weights of canvas refer to the weight for a square yard) making this thing near invincible. Check out these pictures of what are normal weak points on a backpack. You will find them exceptionally reinforced. There are 10 visible rivets on the back of the Thrux Pack. More still are concealed between layers of canvas and leather. This heavy leather string (a little smaller than my pinkie) cinches the top tight to keep the rain out and your things in. Here you can see the flush bottom side of the brass rivets and the suede underside. No glued pigskin that may wrinkle with age. These two brass rivets help hold on the the traps to the top flap. This is manufacturing overkill to put such heavy thread and two large rivets on this strap since it bears relatively little weight. I love this! Detail like this are what make products heirloom quality. This brass YKK zipper is HUGE. No cheap zipper here. There is also the thoughtful detail of little flaps to hold onto when either side of the zipper is pulled. Hefty and classy brass hardware. I am inclined to think these buckles could be slightly larger in proportion to the bag but considering that manufacturing costs on products like this are already very high and these are plenty tough to do the job, I am happy. The shoulder straps take the most stress and the attach points for the shoulder straps are second to none. 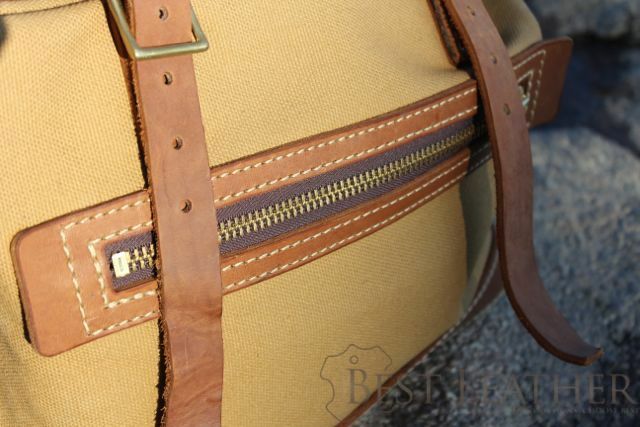 Two rivets and double stitching ensure that the straps will not break, regardless of how much weight you carry. The leather wrapper on the bottom is a signature of Thrux Lawrence. The leather is ultra-tough for getting banged around and will keep your backpack standing upright when it has goods in it. It is like a skid plate. The Thrux Pack has excellent carrying capacity, 22 liters to be precise. This is the kind of bag you tour Europe with. You can go hiking for a few days with this kind of capacity (no North Face-esque ergonomics guaranteed). It has the zippered pocket on the outside for your sundry items like cell phone, pens, keys, flashlight, etc. Note the clever tabs on each side to grip when you slide the zipper. There is a large compartment for bulk items, a pocket for documents (which I am using for my MacBook since it is more insulated from impact there) and the official laptop slot. I put books or paperwork in that pocket. The size of the main compartment can tend to sift your goods to the bottom. Some additional interior pocket(s) for items like a laptop charger and smaller notebooks would be helpful. The rugged nature of this bag is a real standout but it has good functionality too with the two interior slots and the exterior pocket. 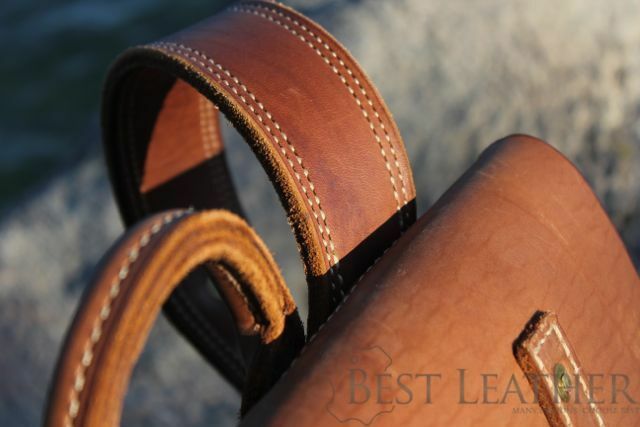 The leather cinch makes sure rain will not leak around the top flap onto your goodies. If you are looking for the functionality of a JanSport, this is not the right bag. But what it lacks in pockets it makes up for in style, durability, and uniqueness. Like a nice custom made pair of boots from White’s Boots, the Thrux pack requires dedication to the break in process. The shoulder straps are 18 oz leather. That is hefty. On the plus side they are so durable your grandkids will civilly discuss rightful ownership of the backpack. On the negative side, you have to be committed to the break in process. At first the straps are stiff and chafe your shoulders. There is no getting around that. You can put Neatsfoot oil on the shoulder straps to soften them but with leather this thick that is a pretty tall order. The best way is to just wear it and let it shape to your shoulders. Those shoulder straps are not too bendy when new. Your shoulders will teach them gentleness and flexibility. The straps will teach your toughness to your shoulders. Yes, those are thick shoulder straps. Some pads might be nice in the next iteration. These are the backpads which are skived down on the edges (skiving is where the sharp edges are cut down with a knife) for greater comfort. The aim is to reduce chafing as much as possible on the lower back like that on the Saddleback Leather Original Backpack “The Tank” which is not made any more. The Thrux Pack will be a perfect bag if you are looking for a bag that will shrug off your abuse, has that classic canvas & leather look, and will break in with you as you use it. This is a backpack you have a bond with from the break in process. It is a testament to American craftsmanship. A love for the symbolism of quality motivates me to enjoy the excellence of these products. I hope my labors are helpful to you. Most photos are shot with a Canon 6D and L glass and are not edited for color. What you see is what you get. 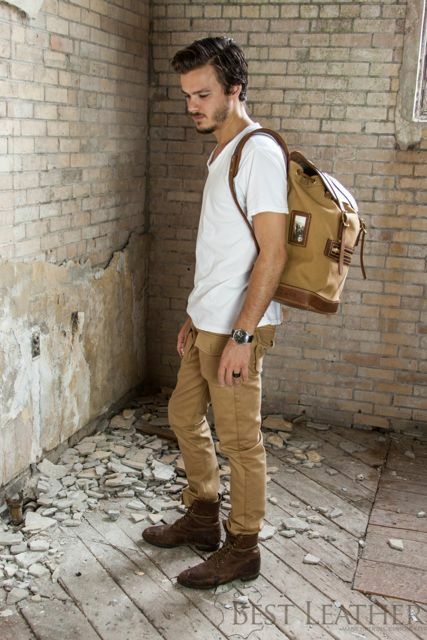 7 Comments on "The Thrux Pack – Canvas and Leather Backpack – $480"